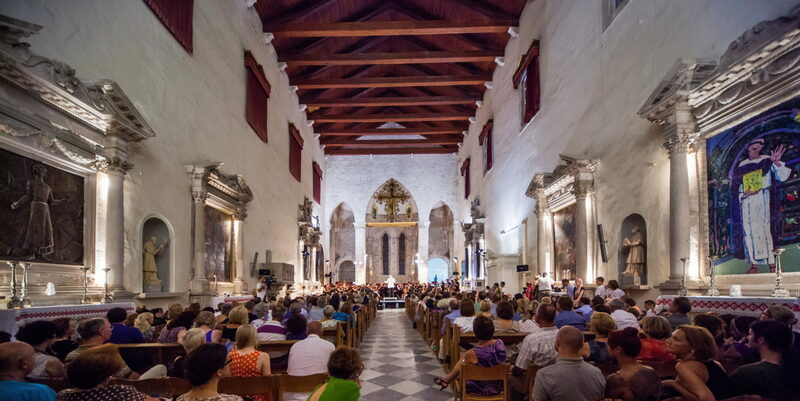 Croatian Radio Television Symphony Orchestra, Choir of King’s College, Cambridge, young Croatian soloists Evelin Novak, Diana Haller and Goran Jurić will perform under the baton of Stephen Cleobury on Monday, 20th August at 9.30 pm at the Dominican Church. They will perform Mozart’s Ave Verum Corpus and Requiem in D minor as well as three numbers from Händel’s oratorio Messiah. Founded already in 1441, the Choir of King’s College, Cambridge is the most famous English choir and the Festival’s audience has the pleasure of listening to it two evenings in a row. Famous conductor and organist and, since 2009, Commander of the Most Excellent Order of the British Empire, Stephen Cleobury has dedicated almost his entire life to enhancing the reputation of this Choir. Croatian soprano Evelin Novak works at the Berlin Staatsoper and she also performs at the Munich Staatsoper as well as in concert halls in Croatia and Germany. Mezzo-soprano Diana Haller gained her musical education all over Europe, she perfected her Baroque singing skills and has won numerous awards as member of chamber ensembles and as a soloist. Tenor Ivan Turšić is a member of the Hannover Staatsoper and he has already sung more than forty opera roles. Bass Goran Jurić is an active opera, oratorio and concert singer and, even though he only graduated in 2010, he has already had numerous roles and won many awards. The Croatian Radio Television Symphony Orchestra has been conducted by numerous renowned conductors and they have performed alongside many famous soloists. They have had a large number of guest performances at festivals in Croatia and abroad, including several performances at the Dubrovnik Summer Festival. At the delight of the Festival’s audience, after a long time the Festival’s programme features Mozart’s masterpiece, Requiem in D major, a piece which Mozart composed until his very death and which he left unfinished. Mozart wrote it believing in divine providence and considering that he was composing what would become his own requiem. It turned out that he was right. The programme also features three numbers from the famous oratorio Messiah by Georg Friedrich Händel – And the glory of the Lord, For unto us a child is born i His yoke is easy. The tickets have almost been sold out and they are available online (festival-dubrovnik.hr) and at box offices at the Festival Palace and on Stradun at a price of 200, 250, 300, 400 and 500 kn.